JIM Gavin remains coy on Stephen Cluxton's availability for Sunday's Leinster SFC final, although the Dublin manager is adamant that his captain would play if fit. 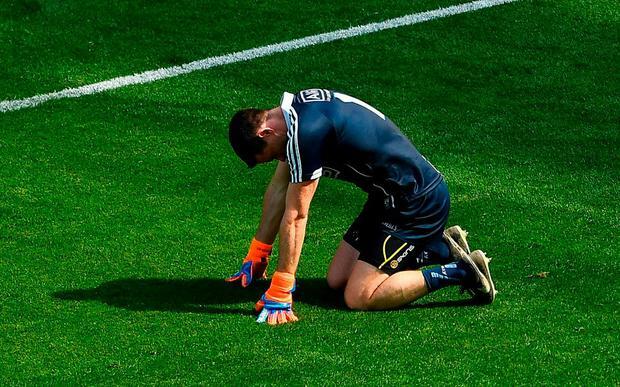 Cluxton hasn't missed a Championship match since 2004 but suffered what Gavin described as a "lower back injury", in his team's provincial semi-final victory over Longford two Sundays back. Speaking at this morning's pre-final press briefing, Gavin stated that Cluxton was "a little bit tender", as a result of the late, high challenge that saw Longford's James McGivney sent off, adding "so we'll make that assessment over the coming days". Asked whether Cluxton had trained since the Longford game, Gavin replied: "Yeah he's been out with us yeah. "Stephen is a tough guy, mentally very strong, determined, so we'll just have to see over the coming days how he progresses. "I'll leave all those assessments to the medical team and the player. "Ultimately it's a player's call, to say whether he's available for selection. So I'll talk to them over the coming hours and days and we'll see how that goes out." Cluxton is the only ever-present in Gavin's Championship selection since becoming Dublin manager in 2012 and he conceded the possible absence of the man he made captain was a new scenario. The likelihood now is that Ballymun Kickhams goalkeeper, Evan Comerford, will wear the number one jersey against Laois on Sunday. "It is, yeah but we've given other goalkeepers opportunities to deal with as well. "But yeah he's been consistently there and that's a testament to his determination for his sport, he's a great passion for it and that's very apparent when you're around him, each time you train with the team, he's a great leader. "But as I said we'll give him every chance and see how it is."